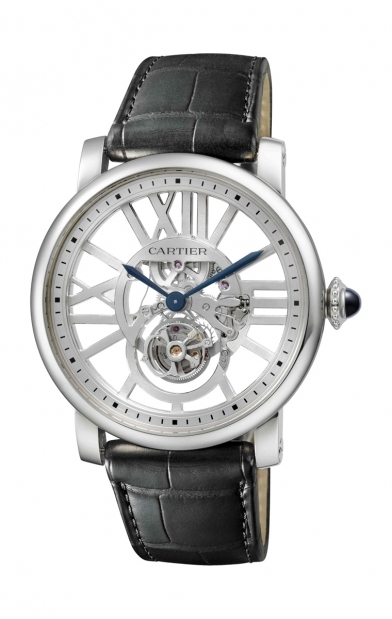 The Rotonde de Cartier Skeleton watch W1580031 is a striking display of watch craftsmanship. 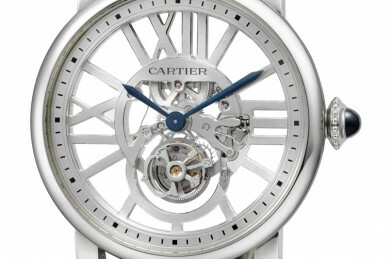 It goes above and beyond with its Cartier-made movements and its stunning skeleton design. It is the perfect watch for watch lovers who love for their watch to be made with the best quality and can go great with any outfit. The Rotonde de Cartier Skeleton watch is a work of art. The case features a complicated mechanical movement with manual winding. The numbers that make up the watch are in the form of skeletonized Roman numerals. They are truly an amazing display. A tourbillon sits near the bottom of the watch. The strap is black and made out of alligator leather. The sapphire crystal protects the watch in the front and back from any damage and is able to withstand scratches and other environmental damages. The watch hands are a dark blue. No numbers appear above the Roman numerals of the watch. Only small squares appear, indicating the time of day. There is not a calender function. The hand wound caliber is 9455 MC. The manual hand winding movement makes 21 600 alterations per hour and the power reserve is up to 50 hours. The case material is made up of 18k white gold and is water resistant up to 30 meters. This Rotonde de Cartier is a limited edition watch so not that many have been made. About 100 timepieces of this watch has been made so far. Each timepiece is individually numbered. The Rotonde de Cartier Skeleton watch W158003 is a limited edition watch that is made with so much sophistication and style. The mechanical movement and tourbillon are an amazing sight to behold. A lot of work went into making these watches. Since these are complicated features, it therefore makes the watch that more valuable to own. The skeletonized Roman numerals on the watch makes it feel like there is a special way to tell the time. You will love showing off the watch to family and friends. It is also the perfect gift to give to someone if you can find it. The price of this limited edition watch is $143,500. New limited edition versions of the watch may be difficult to get. On the Cartier website, the watch is not available to buy.